Martha Berry apologizes for missing Miss Brown while she was visiting and expresses how happy she is that Miss Brown came. She informs Miss Brown that she has been weak and unable to work and expresses her regret that the school cannot support all of the students. 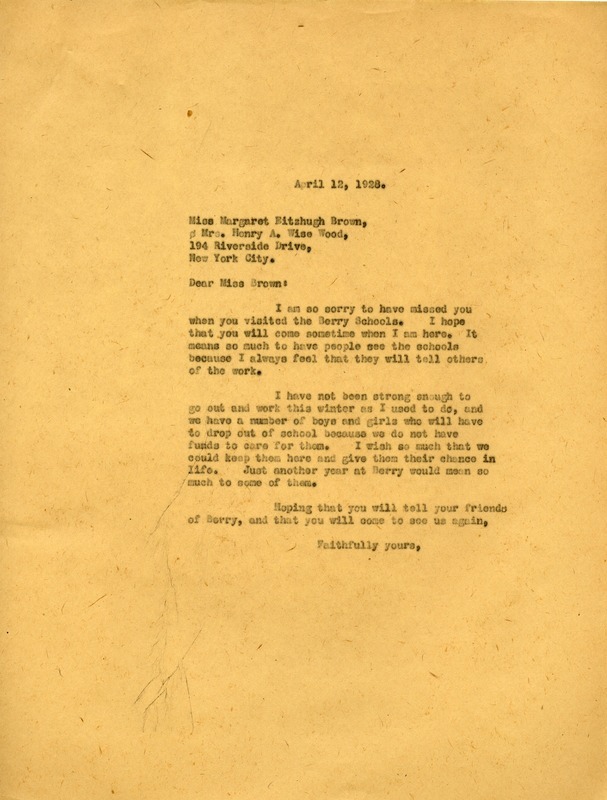 Martha Berry, “Letter to Margaret Fitzhugh Brown from Martha Berry.” Martha Berry Digital Archive. Eds. Schlitz, Stephanie A., Meg Ratliff, Allison Moore, et al. Mount Berry: Berry College, 2012. accessed April 22, 2019, https://mbda.berry.edu/items/show/6799.